Grapefruit always makes me think of luxury. When I was a poor college student, I couldn’t find a dollar to spend on just one pink globe. Not when I tried to make a dollar stretch for an entire dinner. Do you remember those days? Maybe you’re still in those days? Of course, I could find $5 for a bottle of wine with girlfriends. I guess it’s all about priorities. But now, that I’m middle aged with a high school boy to feed (!) I buy grapefruits in bulk at Sam’s Club or from Florida by the case when the local Waldorf school has its annual fundraiser. That reminds me to start looking for the citrus fundraiser signs. They should be going up any day now. I’ve always paired grapefruit with tequila for a Paloma. 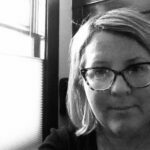 But, about a year or two ago, I fell in love with martinis First it was lemon drops. That martini tasted fresh with equal parts sweet and bitter. Also, my version gives you 41 percent of your daily requirements for Vitamin C. It’s almost like drinking a smoothie, yes? I already had grapefruit and limes in the crisper, so, I picked up some grapefruit vodka—speaking of which, and you small town residents will probably relate, why is it that whenever you’re putting a bottle of vodka in your grocery cart some upstanding member of the community is strolling by at that exact same time and you get a quirked eyebrow? In fact, if I have a pressing question for one of the town’s fathers (i.e. selectmen) all I really need to do is go hang out in the liquor aisles at the grocery store. One of them will come be-bopping along at any moment. Pour juices and vodka in cocktail shaker or mason jar with ice. Shake until shaker or jar is ice cold. Then shake for another minute or two. Pour into martini glass rimmed with salt or not. If you’re going to have a cocktail that tastes good but still allows you to fit into your jeans, you can’t go wrong with a Grapefruit Vodka Martini. Note-my math says one drink has 170 calories. 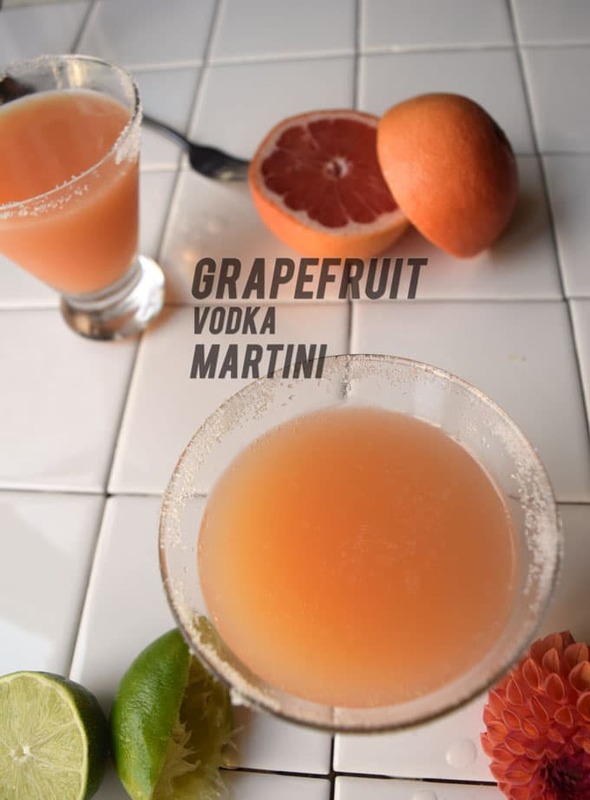 Two ounces of grapefruit vodka is 140 calories plus 11 calories for each ounce of grapefruit juice and 8 calories for an ounce of lime juice. You’re also getting 41 percent of your daily requirement of Vitamin C.
What Foods to Pair with Grapefruit Vodka Martinis? Pour vodka and juices into a cocktail shaker or mason jar packed with ice. Shake for a few minutes or until shaker is ice cold. Pour into a cocktail glass rimmed with salt or sugar or plain. 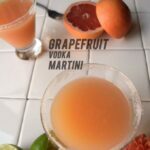 How do you like to eat grapefruits if you’re not juicing one for cocktails? I like to halve it and sprinkle white sugar over the top. I have, at times in my life, owned grapefruit spoons but they’ve disappeared. So I cut around each section of pulp and put the grapefruit half in a bowl to catch all the juice that leaks out. When I’m done shoveling the pulp chunks in my mouth, I lift the bowl to my mouth and tip it back to drink the residual juices. 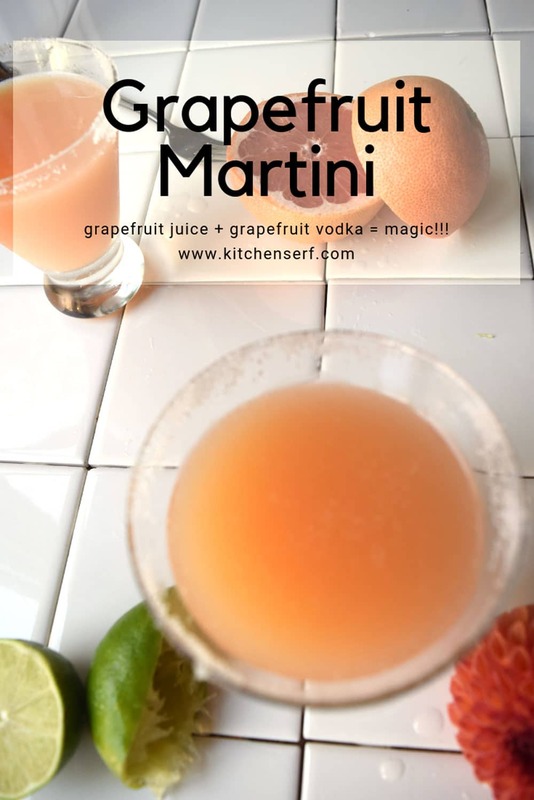 Let me know if you try this drink or take a photo and post it on instagram using the hashtag kitchenserfblog! What are you up to today? Tell me in the comments below. I understand not everyone loves grapefruit. If blood oranges are more your jam, try this drink.